Chitose isn’t a large city like Saporo or Tokyo. But it’s still a compact city with everything built up, especially as you head towards the train station, which serves as the central transportation hub. While I went to the Aeon mall just about every evening because it was closest to the hotel, there was a five story building that contained a mix of businesses, such as one, the 100 Yen Shop. We stopped there on our way back to the hotel from the udon shop. 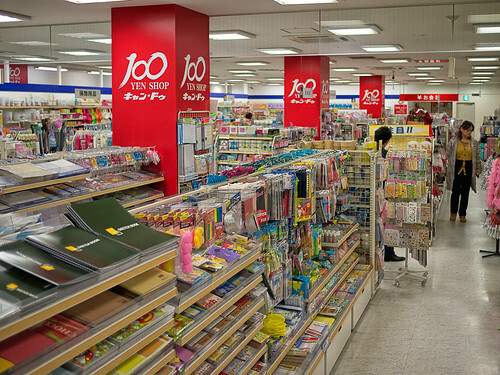 The 100 Yen shop is the equivalent of the Dollar Store here in America. All the items in the store are 100 yen or less. The big difference is that every item in the 100 Yen Shop appears to be of excellent quality. The store is bright and clean, and every item is pleasingly presented to the prospective buyer. No item was out of place and there were no broken packages anywhere. Think of a budget version of Target. One part of the store that almost leaped out as me was this candy section. 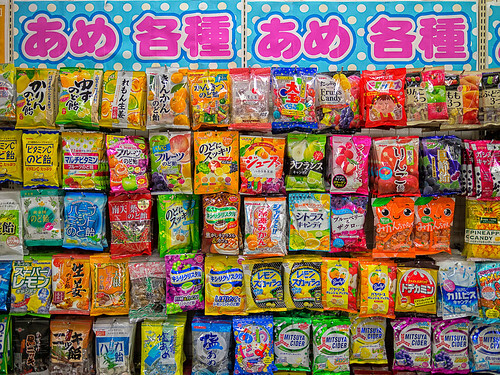 My photography doesn’t do justice to the electric colors for all the various bags of candy that lined the wall. Marketing competition is fierce in Japan, far more so than it seems here in America. All the floors in this department store center were interconnected with elevators and escalators. What I found interesting is that the escalators in this store were only narrow enough for one person to stand. Our American escalators are built to hold at least two abreast, with room to spare. I saw this style of escalator in a number of public buildings. One of the features of many of the escalators (but not here) are photo-detectors that determine when someone walks towards an escalator. 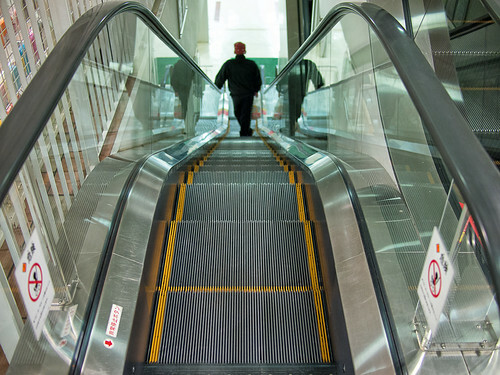 To conserve energy, a lot of escalators are simply turned off if no one is around. When someone approaches, they automatically start moving again. The department store center was filled with many businesses. One floor seemed to be taken over with a book store. On the way through the book store I came across this Snoopy display. The Japanese seem to love cartoon characters, both their own as well as American. 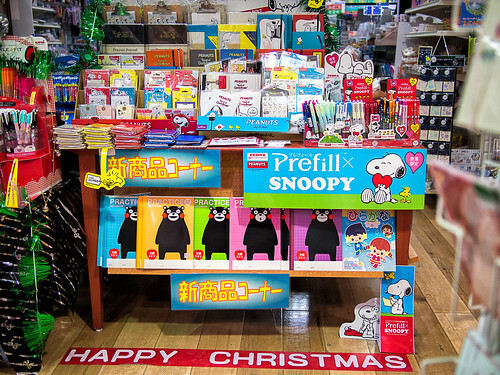 This display combined their deep interest in Snoopy with Christmas. It was oddly touching. I wish I had had more time to just walk about and observe the intersection and intertwining of Japanese and American pop culture. Perhaps when I go back to Japan next February.